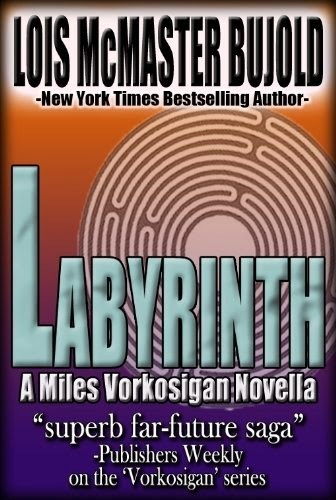 Labyrinth is a short novella featuring Lois McMaster Bujold's signature character of Miles Vorkosigan, once again up to his neck in trouble after a simple mission goes wrong (as they usually do). It's a fun little piece, featuring lots of Miles getting captured, smart-talking his way through interrogations and then escaping whilst throwing an entire world into turmoil but retaining deniability for Barrayar. Whilst it's good, it's slight. There's some interesting stuff about genetic engineering, not to mention the first appearance in the Miles timeline of the quaddies, people who have had their legs replaced with arms to better cope with life in zero-gee. Between the quaddie, the werewolf (actually a genetically-altered super-soldier), the dwarf (Miles) and the hermaphrodite (recurring character Bel Thorne), the novella can be said to be about people who are outcast from some societies due to unthinking prejudice. Unfortunately, the novella's short length prevents Bujold from exploring any of the issues in any real great depth, especially as the fascinating sociological stuff is put on hold for most of the story as we instead follow Miles trying to break out of a prison. That said, Labyrinth (***) is a fun read which cracks along fairly smartly and packs a fair amount of character development and action into a short page count. 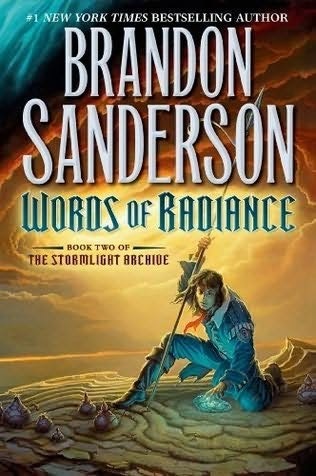 It's just a shame that Bujold didn't flesh the story out into a full novel, as it feels like the characters and issues being explored could have warranted it. Without that exploration, the novella ultimately feels too slight and disposable. The novella is available now in the UK and USA as part of the Miles, Mystery and Mayhem omnibus. Oddly, it is also reprinted in the Miles, Mutants and Microbes omnibus as well. Forty years ago the great dragon Feuerschwinge went on a rampage across Germany, destroying vast areas of land. It was finally killed by the Luftwaffe, working in concert with a dragon-slaying scientist named Vauclair. This event, the Dragonfall, was soon overshadowed as other, even greater disasters threatened humanity. A band of shadowrunners in Berlin uncover evidence that Feuerschwinge is not dead, and may soon return to destroy the Flux-State. They also discover that something is wrong in the Matrix, with deckers dying whilst trying to access information related to the dragon. The shadowrunners may soon hold the fate of Berlin, and possibly the wider world, in their hands. 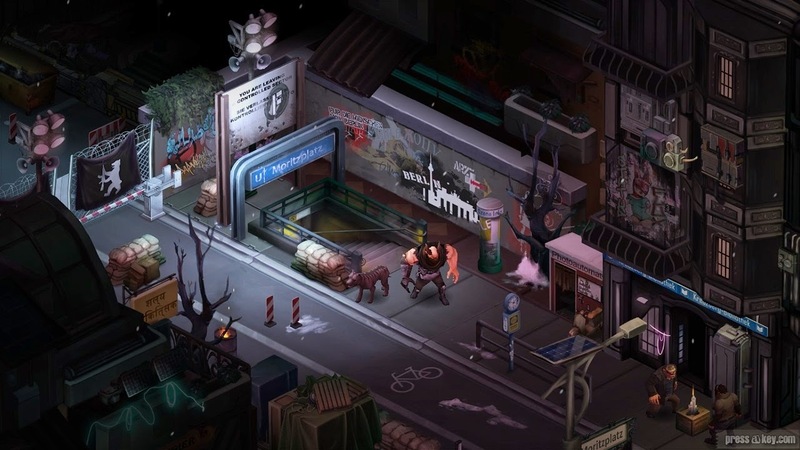 Dragonfall is the first expansion to last year's Shadowrun Returns. Calling it an expansion is to actually do it a disservice: it is a larger, more satisfying and better-written game than its forebear. It clocks in at between 15 and 20 hours in length (compared to the original's 10) and addresses most of the first game's technical issues as well as its creative ones. Once again you start off creating a new character from scratch (you can't port over your character from Dead Man's Switch, the original base campaign) and receiving a message from an old friend. This time you team up with an established band of runners trying to carry out a heist at a remote mansion. Needless to say, things go wrong and soon your band of heroes or, more accurately, morally ambiguous protagonists are laying low at their safehouse. After initial resistance, you manage to take command of the band and have to find out what happened at the mansion, who wants you dead and what the hell is going on. Unlike the original game, you have a full band of runners who accompanies you through the game (though you can still recruit more skilled - but expensive - runners for hire if you really want). This immediately leads to much richer characterisation and character interplay, with you able to check in with your team between missions, learn more about them and help them to deal with their own problems. Early in the game you are floundering in the dark, so have to take on side-missions to raise funds to hire a data expert to work out what's happening. This gives early missions a sense of freeform structure, with you both heading off to other parts of the city on missions and helping out in the deprived neighbourhood where your base is located. The neighbourhood is home to all manner of individuals and taking the time to get to know them early on pays off later, when you can ask them for aid or get additional missions from them. The game is still linear, but it hides its linearity much better than the original campaign, with you able to tackle missions in a variety of different orders. Completing runs gives you karma points which you can use to upgrade your main character's skills. Again, success is not dependent on combat and, indeed, resolving situations without resorting to guns can give you more karma points then wading in and shooting everything in sight (though this also works). Dragonfall is a more confident, assured game than its forebear. The writing is stronger, the dialogue smarter and funnier ("Can you sing?" "I was the frontman for a punk band. No, I cannot sing,") and the characters are much more complex, messier people. The game acknowledges that people who'd rather hang out in grotty bars and risk getting killed for a living are likely to have severe issues, and exploits that to provide some rich (and occasionally disturbing) backgrounds. The game offers up a lot of moral quandaries but these are often even nastier and more difficult to deal with than the previous game's, with plenty of moments when it feels you are trying to make the least-worst choice rather than a 'good' one. The better writing (and the original was pretty good) accompanies some very wise gameplay improvements from the first game. You can now save anywhere, with both quicksave and regular saving options on top of the autosaves. You can even save mid-combat. This eases frustration in the later, epic-length battle sequences. These improvements are also retrofitted into the original Dead Man's Switch campaign. The game also takes you out of turn-based mode once all the enemies in battle are dead rather than forcing you to laboriously move around locations character-by-character, which gets old quickly. The decking sequences in cyberspace are also more optional than necessary, making tasks easier rather than them being mandatory. On the weaker side of things, the game is still focused on combat. There's more ways to avoid it than before and more satisfying conversation options, but almost all of your skills are based on their value in combat. 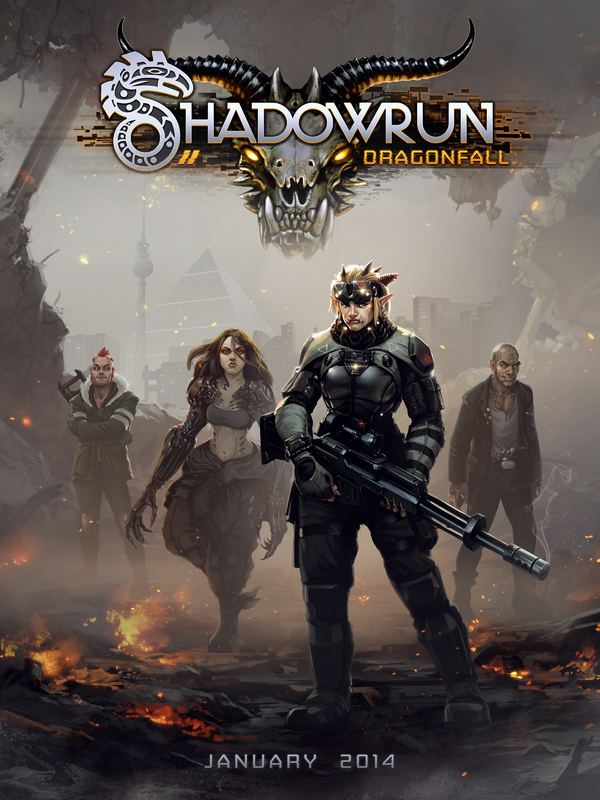 Given that the pen-and-paper Shadowrun RPG is based more around small-scale heists, trying to extract information without the enemy ever being aware of your presence and fighting in the shadows, Dragonfall's emphasis on combat and massive explosions over stealth is a bit odd. There's also the fact that, for the second game in a row, you are trying to save the world, which is much higher stakes than normal for the setting. At least this time around the plot ties in with a core part of Shadowrun lore and is set up from the off, rather than Dead Man Switch's abrupt and unconvincing stakes escalation in its closing hour or so. Dragonfall (****½) is not flawless, but it builds on the impressive foundations of Shadowrun Returns to deliver a well-written, compelling adventure. Much-improved gameplay systems make the game far more rewarding, with some very memorable characters and very satisfying combat. It is available now via Steam. Today is the 553rd anniversary of the Battle of Towton, the most pivotal engagement of the Wars of the Roses. It was fought between the armies of York and Lancaster on 29 March 1461, just south of the English town of Towton in Yorkshire. John Quartley's 19th Century painting of the Battle of Towton. Towton is regarded as a historically important battle. First, it is almost certainly the largest battle ever fought on English (or indeed British) soil. Analysis of the battlefield seems to support suggestions that there were at least 50,000 soldiers present, possibly a lot more, between the two sides. 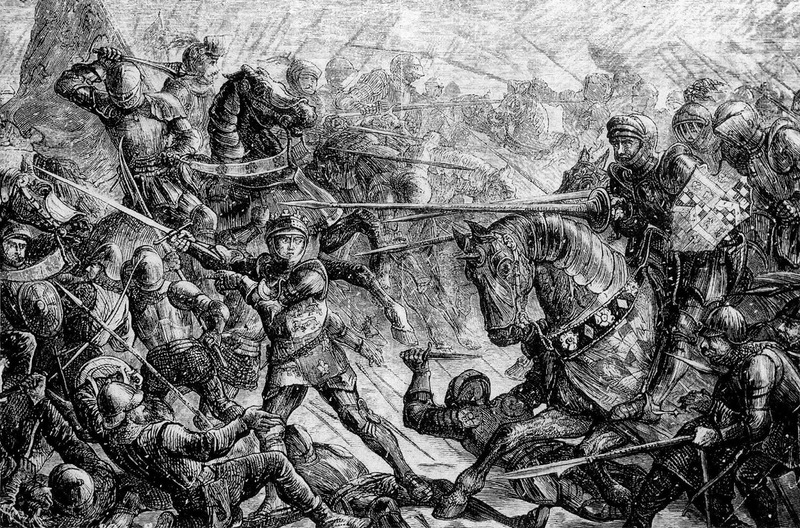 It was easily the largest battle of the Wars of the Roses, and the immense death count helps explain why subsequent battles featured significantly less troops. It was also possibly the bloodiest battle in the history of English armed forces, with credible figures of 28,000 given for the dead. That's 9,000 more even than the first day of the Battle of the Somme. The figures are supported by the fact that more of the English nobility was present at the battle than any other in the war (almost three-quarters of all the lords and knights in the entire country were on the field), meaning that they would have been able to bring a formidable number of levies and vassals to the fight. Henry VI, King of England and (sort of) France. A pious and peaceful ruler to his friends, a weak and ineffectual nutjob to his enemies. The Wars of the Roses resulted from a dynastic dispute between the ruling Lancasterian branch of the Plantagenet family, led for most of the war by the weak, ineffectual and possibly insane King Henry VI, and the Yorkist branch, which had rebelled against the weak rule of the 'mad king'. The conflicting claims to the throne resulted from the deposing (and alleged murder-through-starvation) of King Richard II in 1399 by his cousin, Henry IV. Henry IV's short reign was blighted by rebellions against his rule by loyalists to the old regime. The young Henry V acceded to the throne and unified the disaffected English nobles by launching a major military campaign in France. 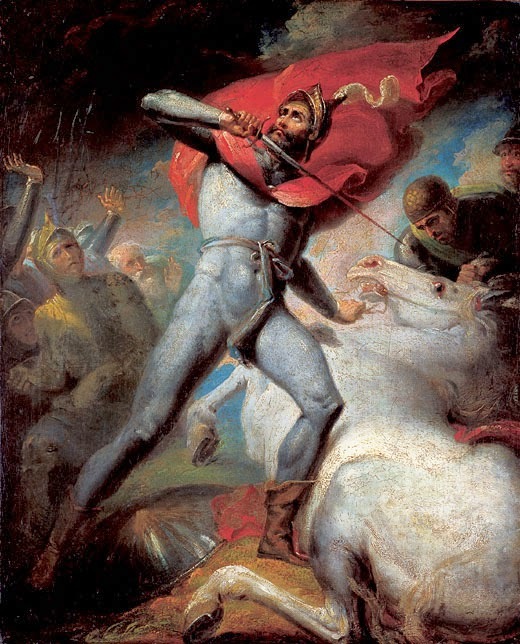 Against the odds, Henry won the Battle of Agincourt in 1415 and secured the capitulation of the French king, who agreed to make Henry's heir his own heir as well, unifying the crowns. Henry V's son was born in 1422, but as the king was only 35 it was expected he would live for many more years. Instead he died, possibly of dysentery, whilst campaigning against French rebels. Henry VI became King of England at the age of nine months and is still the youngest monarch ever to ascend to the throne. Charles VI of France died just a few months later, making Henry King of France as well. However, Henry's claim was disputed by Charles VII of the House of Valois, who was crowned King of France in 1429. Henry's early years were spent mostly in England, where he became a huge fan of the arts and intrigued by civil governance. However, he had absolutely no interest in warfare at all. The military successes of his father and regents were soon frittered away (especially after the 1431 martyrdom of Joan of Arc gave renewed vigour to the French cause). In 1437 Henry turned 16 and became king in his own right. He ignored the advice of his more militaristic cousin and heir presumptive, Duke Richard of York, and pursued policies of peace with France. In 1445 this was secured with Henry's marriage to Margaret of Anjou, the niece of Charles VII. The marriage treaty was combined with a secret transferral of English-held lands in France to the French crown. This news was deeply unpopular in England, especially with Richard. Richard's faction soon grew in power. Henry and Margaret's rule was disastrous: they favoured ineffective and corrupt courtiers despised by lords and commoners alike; they overspent massively; they failed to work for the interests of London merchants; and their military successes were few and far between. Margaret was also a strong-willed political animal who was soon Henry's closest confidante and advisor, something that further infuriated both Richard and many of the people, who regarded her as pursuing French interests over English ones. When Charles VII invaded Normandy, reversing the victories won by Henry V, Henry VI's response was laggardly and unenthusiastic. In 1453 Bordeaux was captured by the French, leaving Calais as the sole English possession on the European continent. Returning troops rioted when they discovered they had not been paid due to the crown's overspending. A year earlier, Duke Richard (after a spell as Lord Governor of Ireland, an appointment made in a futile attempt to limit his power) had presented a list of demands to the king, including the removal of ineffective advisors and the reversal of some of his more unpopular policies. Henry agreed, but Margaret convinced him to renege on the deal. When word of the fall of Bordeaux arrived, Henry had a nervous breakdown and was left insensible for a year. Richard declared himself Protector of the Realm and dismissed most of Henry's loyalists. He also marginalised Margaret, who had just given birth to a son (Edward of Westminster) and reduced her influence. Henry Tresham's rendition of the Earl of Warwick just before the Battle of Towton. According to some, Warwick slew his own horse in front of his men to show that he would not flee the field and abandon them. The historical accuracy of this is questionable. Richard spent a year ruling England and used this time to win the support and loyalty of Richard Neville, the Earl of Warwick. Warwick was a powerful, popular, charismatic and quite staggeringly rich landowner and noble who was also a very skilled and respected soldier. Warwick and York spent their time helping the London merchants and reversing the disastrous spending plans of the old regime. This won them great respect and friends in London and the south. However, on Christmas Day 1454 Henry VI regained his wits. This was seen as a miracle and Henry surprisingly quickly was able to regain most of his former power. He brokered a deal with York that York and his heirs would succeed Henry to the throne rather than his own son. However, Margaret was furious with this idea and soon convinced Henry to go back on it. Margaret and Henry had Richard of York removed from court. Fearing arrest, Richard raised a small army and marched on London in May 1455, declaring his intent to remove the king's corrupt advisors. At the Battle of St. Albans Richard won a decisive victory. Several of the king's closest supporters were killed and Henry himself was found cowering in a tanner's shop, having suffered a relapse of his illness. Richard of York again declared himself Protector of the Realm but once again the king recovered (in February 1456) and had Richard removed from court. He was sent back to Ireland to serve as Lord Governor for a second term. Warwick was also removed from London and dispatched to Calais. The king and his family went on progress through the Midlands, but this was ill-timed. French privateers were raiding the coast and practising piracy in the Channel, whilst there was widespread dissent in the south. Warwick and York also used their exiles to build up new power blocks, with Warwick winning the loyalty of Calais, Kent and parts of London by defeating the French pirates in naval engagements in the Channel and York securing military support in Ireland and Wales. Warwick overstepped his authority by sinking or capturing ships from neutral countries. When he was summoned to court, Warwick declared that it was an attempt to kill him. He and York unified their military forces at Ludlow in Wales, but were surprised by a Lancasterian pre-emptive strike before they were ready. The Yorkists were defeated at the Battle of Ludford Bridge, but York and Warwick survived and escaped back to Ireland and London, although both were now openly attained as traitors. Warwick decided to launch a swift, surprise attack to capture London whilst the king and queen were still in the north. In the event, Warwick was welcomed with open arms and occupied the capital with almost no problems at all. Raising an army, he marched north to intercept the royal army at Northampton and defeated it in battle in July 1460. Henry VI was taken prisoner once more. York landed in Wales and quickly marched to London. Fed up with repeatedly making deals only to have them broken, York claimed the English throne directly. The boldness of the move shocked even Warwick, who believed they were still fighting for influence and control of the weak king, not outright control. Richard produced a detailed claim citing his mutual descent from both the second and fourth sons of King Edward III, whilst Henry was only descended from the third son. The gathered nobles agreed that Richard's claim was superior, but that deposing a king anointed by God was unholy. They made Richard Protector of the Realm (for the third time) and disinherited Edward of Westminsters from the lines of succession, so Richard or his sons would later take the throne instead. The deal was rejected by Margaret of Anjou, who had remained in the north. She negotiated an alliance with Queen-Consort Mary of Scotland, gaining a large army which she used to engage the Yorkist forces at Wakefield in December 1460. In a pitched battle, Richard, Duke of York, was unexpectedly slain and the Lancasterians gained a total and commanding victory. Richard's claim was inherited by his son, Edward, Duke of March. Only eighteen years old, Edward was already a skilled soldier and an inspirational commander. Hungry for revenge, Edward and Warwick raised fresh troops but were defeated at the Second Battle of St. Albans. The captive Henry VI had been taken to the battlefield and was rescued by the Lancasterians in its aftermath. However, the Lancasterians failed to capitalise on their victory: the south had turned against them, with Coventry declaring for York, and supplying their army became difficult. They retreated north to Yorkshire to gather a new, larger army. In early 1461, Warwick and Edward regrouped in London, where Edward was crowned as Edward IV of England in a brief ceremony. They then marched north from London, gathering all the strength of the south and all of their other supporters to them. Richard Caton Woodville's depiction of the battle, focusing on the fighting along the river along the side of the battlefield. The two armies had grown to extreme sizes by the time they met at the town of Towtown on 29 March, a reflection of the seriousness of the situation. Almost the entire English nobility had turned out to the battle, declaring for one side or the other. The Lancastrians had an estimated 30-35,000 troops to the Yorkist 20-25,000, but the Yorkists succeeded in claiming superior, flat ground at the southern end of the battlefield. The Lancastrian position gave them limited visibility and also wedged them between several areas of marshland and a small river, preventing them from deploying their superior numbers to turn the Yorkist flanks. Even worse, the wind was blowing strongly from the south when battle was joined. The Earl of Warwick's uncle, Lord Fauconberg, was a noted expert in archery and immediately deployed the Yorkist archers to fire from the limit of their range. The wind carred the arrows into the Lancastrian ranks, immediately causing havoc. Return fire into the wind was ineffective, and soon the Yorkists had achieved significant casualties amongst the Lancastrian ranks before direct blows had been exchanged. When the Yorkist archers ran out of arrows, they advanced, retreived enemy arrows, and continued to fire. The Lancastrians finally charged rather than be shot to death. Despite the high number of casualties caused by the Yorkist archers, the Lancastrians still almost turned the battle through the ferocity of their charge, accompanied by a sally of horsemen hidden in a nearby woodland. 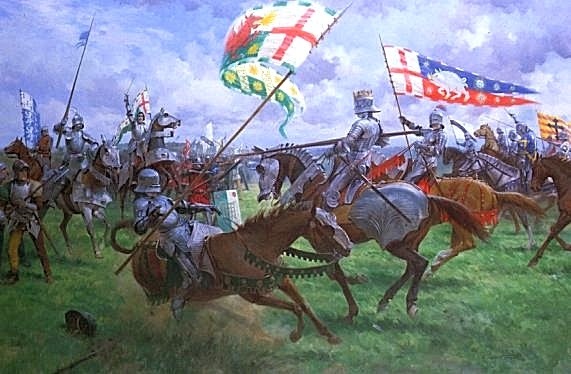 This cavalry charge into the Yorkist left flank almost shattered it, but Edward IV hoisted his banner and rode personally into the fray, inspiring his men through his courage. The flanking attack was defeated and the York line stiffened. However, the two forces were still evenly matched and the battle descended into a bloody engagement of attrition. Some reports claim that combat lasted for ten hours, an almost-unheard of length for a medieval engagement. Roughly halfway through the battle, the forces of the Duke of Norfolk arrived to support Edward. Hidden by the terrain until the last moment, these reinforcements hit the Lancastrian left flank and began to turn it. Whilst the Lancastrians prevented a total collapse and rout, they were now hard-pressed. Eventually the Lancastrians admitted defeat and withdrew. The Yorkists were too exhausted to pursue. By a pre-standing agreement that this battle would finally decide the matter, some of the Lancastrian supporters went over to Edward. The battlefield following the engagement was an unusually grisly sight, even by the standards of the day, and part of the field was renamed the Bloody Meadow, for the grass had turned red through the blood that had seeped into it. The sheer volume of casualties led to some of the most unchivalrous behaviour of the wars, with scores of captured Lancastrian knights being executed on the spot rather than held for ransom. Richard III slays Sir William Brandon (Henry VII's standard-bearer) at the Battle of Bosworth Field in 1483. Richard's charge of a thousand knights almost turned the battle, but he was slain and the Wars of the Roses effectively ended. Margaret of Anjou and Henry retreated to Scotland, a move which further increased support for Edward IV in England. The Earl of Warwick and other Lancastrian supporters were rewarded and swept the remaining Lancastrians from power. Henry VI made several sallies from Scotland to try to regain his support, but he was captured at Clitheroe in 1465 and taken to London. This forced Scotland to sue for peace, which meant that Margaret and her son Edward had to take refuge in France instead. Other exiled Lancastrian supporters, such as Jasper Tudor, continued the fight, hoping to raise fresh forces on the continent, but it appeared that their cause was completely lost. Astonishingly, their hopes were reignited by someone who had been their bitterest enemy: Richard Neville, Earl of Warwick, the Kingmaker. In 1464 Warwick negotiated the marriage of Edward IV to the daughter of the King of France, a considerable coup which would almost certainly remove the last vestiges of support for Margaret. Instead, Edward annoued he had married the widow of a minor nobleman, Elizabeth Woodville. Warwick was furious with what he saw as a betrayal by the king, whom he regarded as a protege (and, unwisely, as not skilled at warfare). This was worsened when the Woodvilles were given more influence and power at court. In 1469 Warwick conspired to put Edward's brother George on the throne. This plan backfired and Warwick and George were forced to flee to France. There they struck a treacherous alliance with Margaret of Anjou, with Warwick's daughter Anne Neville marrying Edward of Westminster. They invaded England in 1470 and retook London, restoring the captive Henry VI as the King of England. Edward fled to France, but Warwick overreached himself and offended the extremely powerful Duke of Burgundy, who was kin to the Woodvilles. The Duke provided Edward with the forces he needed to re-invade England and capture York. He marched south, gaining fresh support, retook London and and attacked Warwick's army at the Battle of Barnet. Warwick was killed. Margaret and her son regrouped in Wales, but found their allies deserting them. When Gloucester defected to Edward's camp, they found themselves stranded on the wrong side of the Severn. They were engaged by the royal forces at the Battle of Tewkesbury in early 1471 and defeated, with Edward of Westminster killed (becoming the first and only heir to the English throne to die in battle). King Henry VI, again imprisoned in London, was found dead a few weeks later. Although it was claimed he had died of a broken heart after learning of his son's death, it is now thought more likely was killed by supporters of Edward to end the Lancastrian claim to the throne. Anne Neville was forgiven the crimes of her father and late husband and was taken back into the king's peace. She later even married the king's youngest brother, Richard. 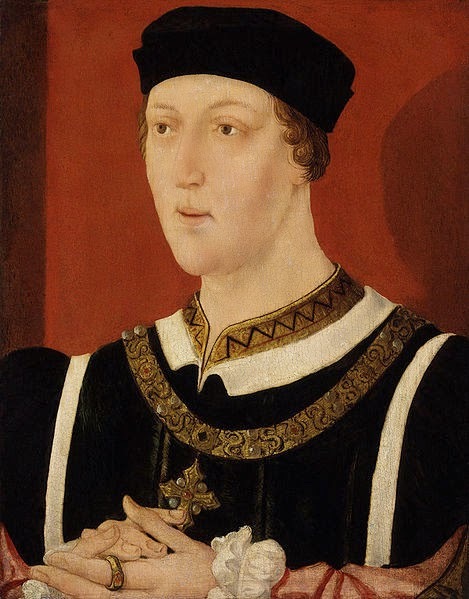 Henry VI's remaining heir, Henry Tudor, was in exile in France and his somewhat questionable descent from Edward III meant that Edward IV disregarded him as a serious rival. Edward IV ruled until 1483 when he died suddenly, although he had become indolent and something of a wastrel once the wars were won, more interested in fighting and (alledgedly) women then governance. His son, Edward V, was expected to inherit with Richard as regent, but Richard unexpectedly executed Queen Elizabeth's brother, Edward V's protector, as a traitor. Elizabeth herself took refuge in Westminster Abbey and Richard claimed the throne by saying that Edward V and his siblings were bastards, as the controversial marriage between Elizabeth and Edward IV had not been legal. Edward V and his younger brother both disappeared without a trace from their holdings in the Tower of London sometime in the summer of 1463. In a coming-together of former enemies almost as unlikely as that of Warwick and Margaret of Anjou, Elizabeth Woodville and Margaret Beaufort, the mother of the exiled Henry Tudor, agreed to join forces. Henry was betrothed to Elizabeth and Edward IV's daughter, Elizabeth of York, and Margaret convinced her current husband, Lord Thomas Stanley, to switch sides. Stanley had become one of the most powerful nobles in the country and commanded respect. However, he would not commit until it was clear that Henry Tudor could win. When Henry's forces invaded England and Richard marched against him, Stanley continued to hold back his decision. When the two armies met at Bosworth Field and Henry gained the upper hand, Stanley betrayed Richard and helped destroy his army. Richard III was slain on the battlefield and Henry took the crown as Henry VII of the House of Tudor, uniting the former houses of Lancaster and York through his marriage to Elizabeth of York. This marriage ended the Wars of the Roses (a few minor rebellions aside) and began one of the greatest dynasties of English monarchies; their second son Henry became Henry VIII and their granddaughter was Elizabeth I of England. 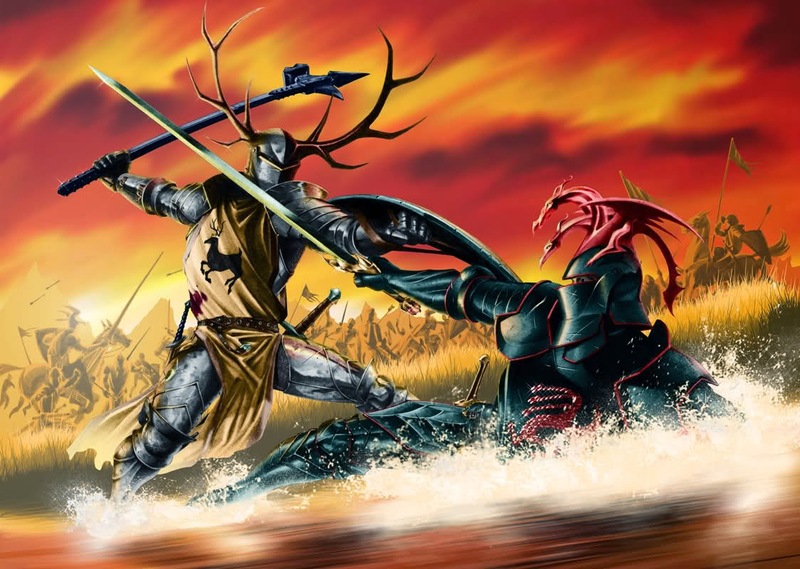 The Battle of the Trident in A Song of Ice and Fire, where Robert Baratheon slew Rhaegar Targaryen, the son of the Mad King, and won the Iron Throne. The names 'Stark' and 'Lannister' are echoes of 'York' and 'Lancaster', although of course the details of the families are very different: York and Lancaster were branches of the same tree of descent, worshipped the same religion and most of the members of the two houses were related to one another. The casus belli for the Wars of the Roses was the mismanagement of the kingdom caused by the 'Mad King', Henry VI, similar to how Aerys II Targaryen sparked Robert's Rebellion. However, whilst Aerys's insanity resulted in him burning people alive and executing people for no reason, Henry's manifested as a catatonic state lasting months at a time. The initial rebellion against Henry focused more on how he was served by poor advisors, a theme touched on in ASoIaF (particularly on how Varys's advice to Aerys seemed to backfire) but not as prevalent. The term 'Protector of the Realm' was claimed by both Richard of York and Eddard Stark. 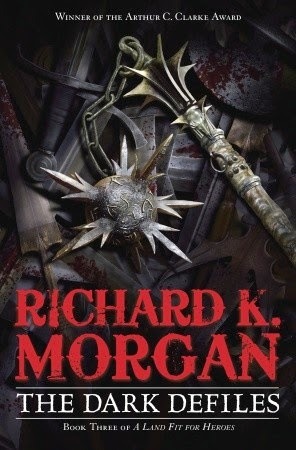 However, whilst Eddard was honourable to a fault, Richard was more self-serving and a more politically savvy person. The Battle of Towton ended the war with a surprise victory for the numerically inferior force led by a young but charismatic and skilled teenager. 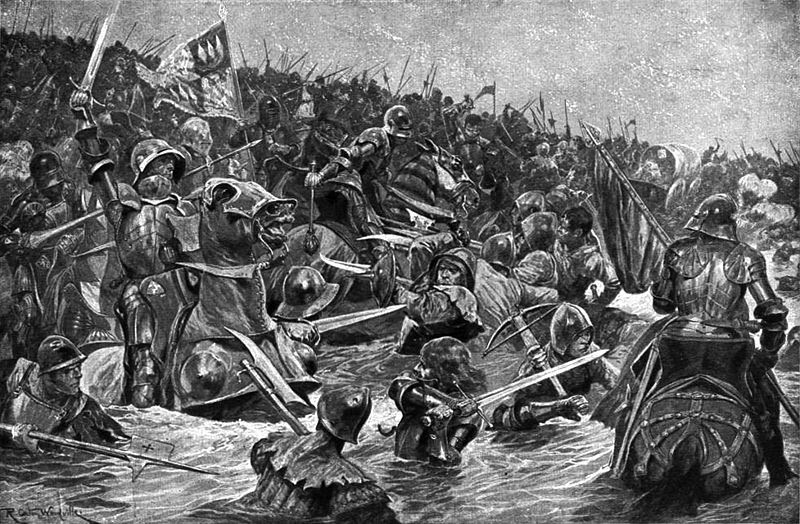 The battle is in many respects a dead ringer for the Battle of the Trident, although the Battle of Towton was fought alongside a small river rather than over a large one and Edward IV did not kill Henry VI's heir there. Edward IV's life story - a young, brilliant fighter slightly underestimated who turned into a strong war-leader who became a king but, bored of rule, became a bit of a fat drunkard, and whose death sparked a renewed period of civil war (including a dubious claim to the throne by his youngest brother) - bears strong similarities to that of Robert Baratheon. A key difference is that Edward seems to have loved his wife Elizabeth Woodville, and there are no indications Elizabeth ever slept with her brother. There are also echoes of the later Henry VIII in Robert. Lord Thomas Stanley is seen as a ruthlessly pragmatic man who wants to improve the power of his family and is ready to support any course to do so. He withholds his army until a victor emerges and then joins with it. This can be seen as an analogue of Lord Tywin Lannister. Other elements can be seen in other historical figures: Warwick's immense fame, influence and wealth, not to mention him reacting badly to any slight, are also traits of Tywin's. The overall course of the war - the Lancasters and Yorks basically fighting one another whilst suffering in-fighting between their own forces and eventually both being trumped by the Tudors - can be seen somewhat reflected in the Starks and Lannisters fighting one another to exhaustion only for the Tyrells (whose symbol is a rose) to rise to power afterwards. For literal references: Ser Criston Cole of the Kingsguard, whose support for Aegon II rather than Rhaenyra sparked the Dance of Dragons, was called the 'Kingmaker', like Richard Neville, Earl of Warwick. The sisters of King Baelor the Blessed were locked up in the Maidenvault and became known as the 'Princesses in the Tower', similar to how Edward V and his brother Richard became the Princes in the Tower. Fortunately, the princesses had a happier fate. Of course, A Song of Ice and Fire is not just the Wars of the Roses with the serial numbers lopped off, but Martin has cited them as an influence and inspiration in certain places. 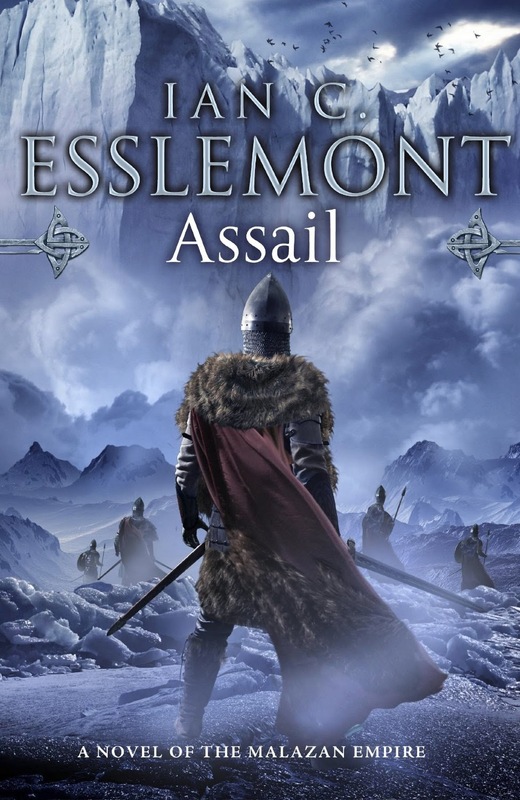 Transworld have unveiled the cover art for Assail by Ian Cameron Esslemont. 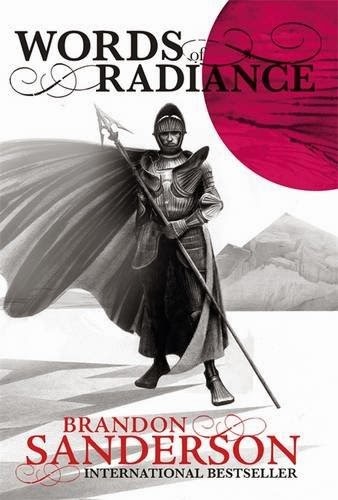 The final (for now) novel in his Malazan Empire series, which resolves questions from both his earlier novels and Steven Erikson's Malazan novels, this book takes us to the mysterious, oft-mentioned continent of Assail. This is a land where even the T'lan Imass and ascendants fear to tread, a continent of unrelenting hostility and danger. Forces from across the Malazan world converge on Assail for a final reckoning. Assail will be published on 3 July this year. A band of adventurers are among the mercenaries called in to help defend the remote settlements of Icewind Dale after they come under attack by an army of monstrous creatures. Investigating the causes of the raids, the team embark on a lengthy trek into the hostile Spine of the World mountains. 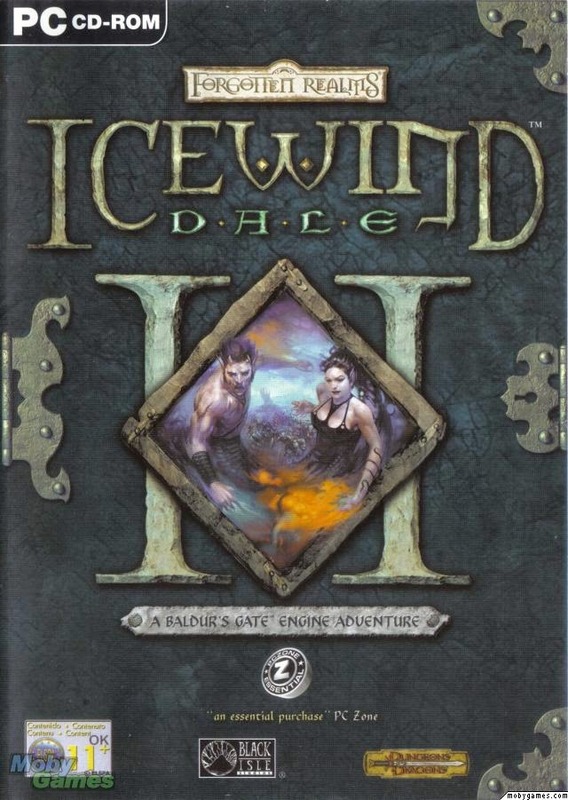 Icewind Dale II was released in 2002 and was the fifth and last game to use the Infinity Engine. Originally used for Baldur's Gate in 1998, the Infinity Engine had powered a whole series of classic roleplaying games and was arguably the last great 2D engine before most games switched to 3D technology. At the time of its release, Icewind Dale II was heavily criticised for using old tech, made even more apparent by it coming out just a month or so after BioWare's Neverwinter Nights, with it's all-singing, all-dancing 3D engine. Played without regard for such concerns, Icewind Dale II emerges as an enjoyable, solid roleplaying game much in the vein of its predecessor. The Icewind Dale games are very much the 'brainless action movie' branch of the Infinity Engine tree, where combat is emphasised over roleplaying. There isn't anything too wrong with that, especially since Icewind Dale II also puts more emphasis into puzzle-solving, quest-resolving and occasional bursts of proper roleplaying. You still spend 80%+ of the game hacking enemies apart, but there's a little bit more story and character to proceedings this time around. As with the previous game, you create a party of six adventurers from scratch. Balancing melee combat characters with ranged ones with magic users (and a rogue to help open all of those locked chests of loot) is key to completing the game effectively. 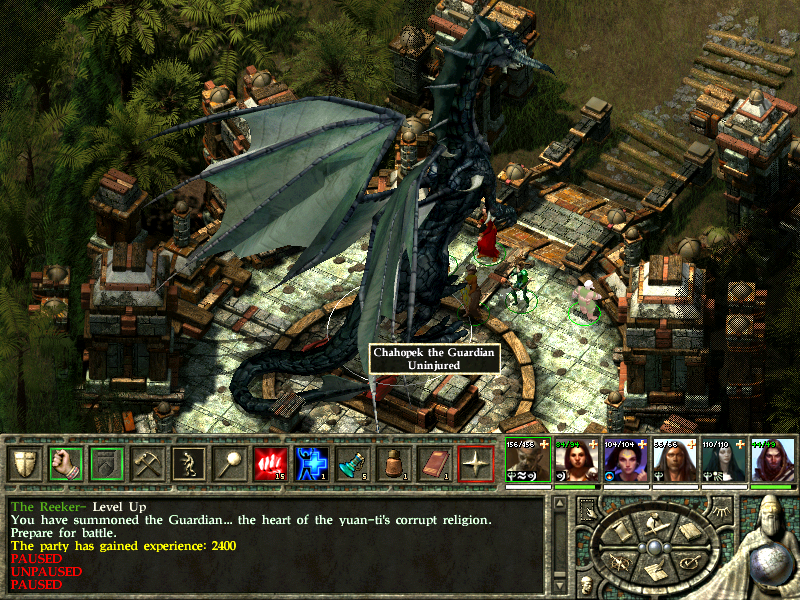 Unlike the other Infinity Engine games, Icewind Dale II uses the Dungeons and Dragons 3rd Edition rules which gives your characters much greater choices of weapons (no more arbitrary restrictions by class), classes (no more arbitrary restrictions by race) and skills and feats, which improve your combat abilities. You start the game in the town of Targos which is under goblin attack. After dispatching the attackers you find yourself running around town getting to know people and finding out more about what's going on. This being a game by Black Isle (which splintered apart shortly after this game's release, the remnants reforming as Obsidian and Troika), with such CRPG luminaries as Josh Sawyer and Chris Avellone working on it, the game features some amusing meta-commentary about the genre. One soldier recounts how he started his adventuring life by killing rats for ages because it was 'character-building', whilst running around town doing trivial odd-jobs for pitiful amounts of money. This was funny at the time, but is slightly tragic in 2014 given how many modern RPGs still insist on using the same structure. The game is linear, with your team moving from objective to objective without as much ability to go off and do some exploring by yourself (although there a few optional side-quests). This makes sense in the context of the game - you are a mercenary party on a military commission to halt an invading army - and also given the time restrictions the game was made under, but it does feel a little constraining at times. The game is also pretty relentless and, in the midgame especially, becomes something of a grind. The environments are beautiful, ranging from palaces made of ice to spectacular underground caverns and windswept mountain passes filled with snow. However, too often there is little to do in these environments rather than bludgeon lots of things to death and search for loot. There are a few moments of satisfying roleplaying - doing a side-mission near the end of the game makes the final battle considerably easier, whilst you can completely skip a lengthy and lethal battle in a mind-flayer fortress by convincing their relentlessly logical leader that it's just safer to let you pass - but the focus is very much on fighting. Fortunately the fighting is pretty good. As usual you can pause the game to issue orders and battles soon become a frenzied rush of arrows, swords swinging and spells flying past. As the game progresses enemies become more likely to use magic, so it becomes necessary for your party to use magic to buff your characters or summon small armies of monsters to act as cannon fodder. 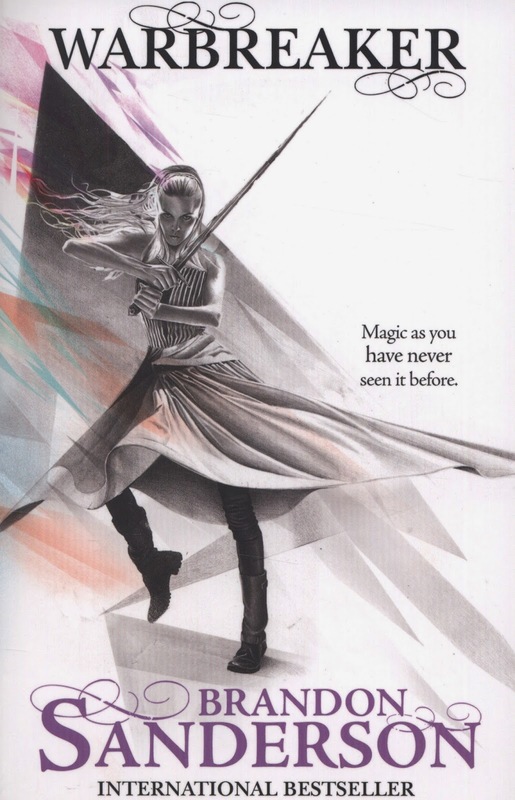 Unlike, say, the Dragon Age games, which have a seriously tiny spell selection (presumably for simplicity's sake), Icewind Dale II offers a large range of spells, weapons and combat options which can tend towards over-complexity, but also give the player a satisfying choice of tactics to pursue. Many seemingly-impossible battles can be won by simply changing tactics or even just the positioning of your characters: bottlenecking large enemy forces in narrow passages is a simple but often decisive tactic. So the combat is good, the choices for character development are better than any previous Infinity Engine games and the story is moodily and effectively told through animated storybook cut-scenes. For its time, the 2D graphics are impressive (if inevitably a little pixellated on modern machines) and the music is splendid, though there isn't a whole lot of it. The game is pretty long (clocking in at well over 20 hours) so you get a lot of content for your money. The game gets grindy and repetitive at times, but it's worth persevering for the satisfyingly epic conclusion. Icewind Dale II (****) is a worthy follow-up to Icewind Dale and a decent conclusion to the Infinity Engine era of roleplaying games. You can get the game now from GoG, where it has been optimised to run well on modern machines, or you can also get it as part of a triple-pack with the original Icewind Dale and its expansions (UK, USA). Francis Underwood is an ambitious American politician. When a promised cabinet position is given to someone else, Underwoord embarks upon a Machiavellian scheme to get revenge and place himself at the centre of American political power. 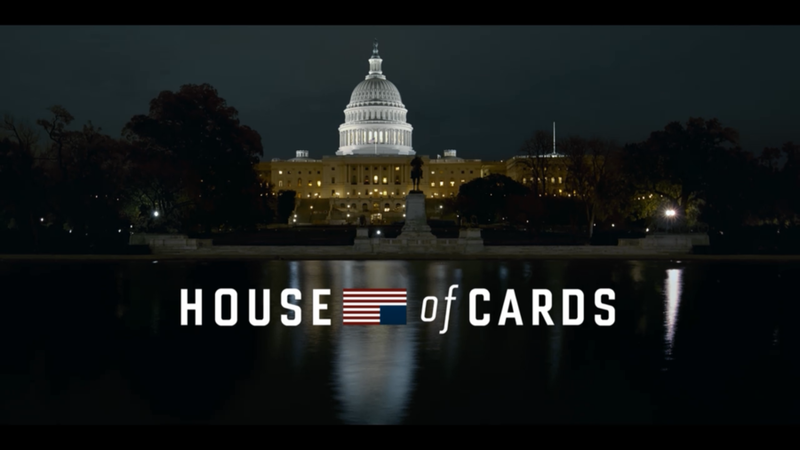 House of Cards started life as a trilogy of novels written by Michael Dobbs, a British politician and senior member of the Conservative Party. The books were adapted for the BBC with Ian Richardson playing the scheming Francis Urquhart, who rises from his party whip to a more senior position through a combination of political acumen, blackmail, engineering scandals and, as a matter of last resort, murder. Both the book and TV series examined politics, power, the media and corruption, with their dialogue forming catchphrases still used in modern British politics. The series is regarded as a classic, with Richardson's portrayal of the monstrous Urquhart being a masterclass in screen villainy. Two and a half decades later, we have the American remake. The action is moved to Washington, D.C. and the story is modified to take into account a much greater running time (thirteen episodes per season compared to the British four), a much larger cast and changes in technology in the intervening years. In particular, the journalist subplot is now modified to take into account the growing influence of social media on modern politics, picking up on themes previously seen in the final season of The Wire (although, like that season, House of Cards struggles to say much beyond the obvious about the decline of print journalism). Obviously the politics are tweaked to match the American political system. Despite all of that the original story shines through, enough that if you are familiar with the original than the plot risks becoming predictable. Fortunately, this problem is reduced by the sheer quality of the production. This is a glossy, expensive series with a cast of top-drawer American talent. Familiar faces Kevin Spacey and Robin Wright anchor the production through intense performances. Spacey hides steel and resolve behind a veneer of Southern courtesy and charm, an effective device which starts to wear a little thin by the end of the series. Underwood's machinations are impressive, but his utter contempt for those he considers inferior and whom he doesn't need is so obvious that it's questionable if he would have really gained the reputation he has in the series. One episode, in which Underwood is reunited with his old military college buddies, hints at a much lighter and more fun person that Underwood has had to suppress in furtherance of his career, but it's the only moment where character or emotional development takes place. The asides to camera from the original series are also retained, although they are a little bit more inexplicable in this new version: Richardson dominated the original series and was in the overwhelming majority of scenes, so it made more sense. Here the cast is more of an ensemble and just one of them breaking the fourth wall feels a little pointless . It also doesn't help that many of these asides are either random ("I detest children. There, I've said it!") or tell us the obvious, but Spacey sells even the tritest lines with conviction and menace. Wright's performance as Claire is more impressive. Claire is a more complex figure, as ruthless as Underwood in some respects but also possessing (slightly) more of a conscience. She also has more regrets about how much pursuing her husband's career and developing her own (as the head of a charity) has forced her to sacrifice her personal desires. If Underwood has no real character growth in the series, Claire makes up for it, especially when their objectives clash. The rest of the cast is effective, with Corey Stoll charismatically playing congressman Peter Russo, a man of conviction and integrity whose life is undermined by substance abuse and conscience-shattering political compromises. Russo's character arc is somewhat mechanical and predictable (especially if you've seen the original series) but the actor manages to sell even the more eyebrow-raising character turns. Kata Mara is also effective in her role as journalist Zoe Barnes. Whilst Barnes's character arc is reasonably well-done (believing herself to be in a role of mutual manipulation with Underwood, which turns into a realisation she may have been cynically used to help his planned ascent to power), her choices and decisions make her a less than likable figure, which is a refreshing choice for what is presented as the leading female protagonist of the series. The show is mostly well-written, though not as well-written as it thinks it is. There is a thin line between profundity and pretension and the show makes a habit of stumbling into the latter whilst searching for the former. The writing aims to make the dialogue snappy, intelligent and witty and succeeds more than it does not, but when it fails the dialogue can become leaden, over-expositionary and redundant. Some of these issues are artifacts of the massively expanded running time: by the end of the first season of thirteen episodes, the story has not even reached the end of the first British season of just four. There's a huge amount of filler in the middle episodes, some of it well-handled but a lot of it just feels pointless (the 'Peachoid' incident most notably). It might be wished that the show had more ambitiously adapted the entire original British series (twelve episodes in total) and had left it at that. Structurally, this expansion to (at least) thirty-nine episodes feels like the show is bloating itself out too much in the name of commercial success. Still, as often as the show stumbles and as padded as it is, the first season of House of Cards (****) is still a success, driven forward by splendid performances and a coldly cynical assessment of how American politics work. The season is available now in the UK (DVD, Blu-Ray) and USA (DVD, Blu-Ray). Frontier Developments, the makers of Elite: Dangerous, have released a gameplay video showing how docking with space stations will work in the new game. Veterans of the 30-year-old space trading series will know that docking has always been a tricky proposition in the series. The original Elite required careful lining up of the spacecraft with the docking port, matching rotation and slowly moving towards the station until the ship either successfully docked (about 20% of the time) or smashed into the docking bay walls at the last moment and exploded (the other 80%). It's rather notable that the sequels, Frontier and First Encounters, both made docking an automated affair to avoid the problem. Elite: Dangerous returns to a manual docking approach and is easier, but requires the pilot to steer the ship to the correct docking bay inside the space station. You'll be able to buy docking computers later on to speed the process up, but they seem to have hit the right balance between making the game fun to play but not giving you everything on a plate. Elite: Dangerous is tentatively scheduled for release later in the year, although don't be too surprised if there is a delay into 2015. The game's coming together impressively with each alpha iteration and trailer, but they've still got a little way to go. 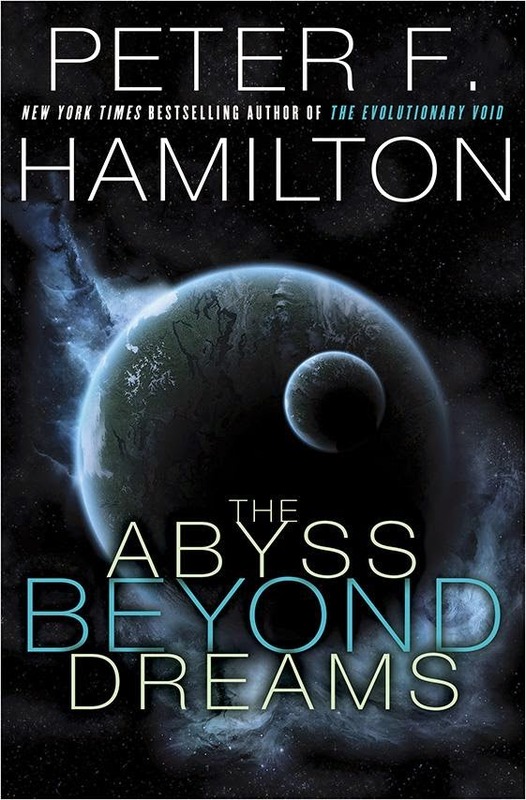 Del Rey have released the American cover art for Peter F. Hamilton's new epic SF novel, The Abyss Beyond Dreams, the first novel in The Chronicle of the Fallers duology. The first of a two-book science fiction series set in New York Times bestselling author Hamilton's acclaimed Commonwealth universe. Thriller writer Ken Follett calls Peter F. Hamilton "the owner of the most powerful imagination in science fiction." A clash of cultures in the Void pits humanity against a shape-changing alien species, and sees if two warring races can ever cooperate enough to free themselves from their mutual prison. Series Overview: Peter F. Hamilton returns to the Commonwealth universe with a clash of cultures in the Void that pits humanity against a shape-changing alien species. The book will be published on 21 October this year, with an estimated hardcover page count of 672 pages. According to Hamilton, the book clocks in at around 198,000 words, surprisingly concise by his standards (The Naked God came in at almost 450,000 words and approximately 1,150 pages in hardcover). The UK edition, from Pan Macmillan, should be out around the same time. 5 Lives Studios have revealed the first substantial ingame footage from their upcoming cyberpunk game Satellite Reign. Satellite Reign is a successor to the classic 1990s games Syndicate, Syndicate: American Revolt and Syndicate Wars (and absolutely not the weak 2012 FPS from EA), made by some of the same development team. Like those games it will be an isometric game where you control four agents on the streets of a futuristic city, complete with vehicles, towering buildings and tons of civilians wandering around (who can be recruited to further your own ends, or blown up if you're a psychopath). Satellite Reign will add more specialised skills (such as hacking) and of course much shinier graphics. Satellite Reign was due to be released at the end of 2014, but it's starting to look more and more like a 2015 release. Polish developers 11bit Studios have announced their new game, This War of Mine, about a war being fought between two forces for control of a city. In a break with tradition, this game will be played from the POV of the civilians caught in the crossfire, with the player having to guide civilians to safety and secure supplies and medical aid whilst avoiding gunfights on the streets. The music is from the 1969 track 'Gyöngyhajú lány' ('The Girl With the Pearly Hair') by Hungarian band Omega, recently sampled by Kanye West. Not much else has been revealed about the game so far, but it sounds like an interesting revisionist twist on a lot of video games about war which are resolutely focused on the people doing the shooting rather than those caught on the sidelines. 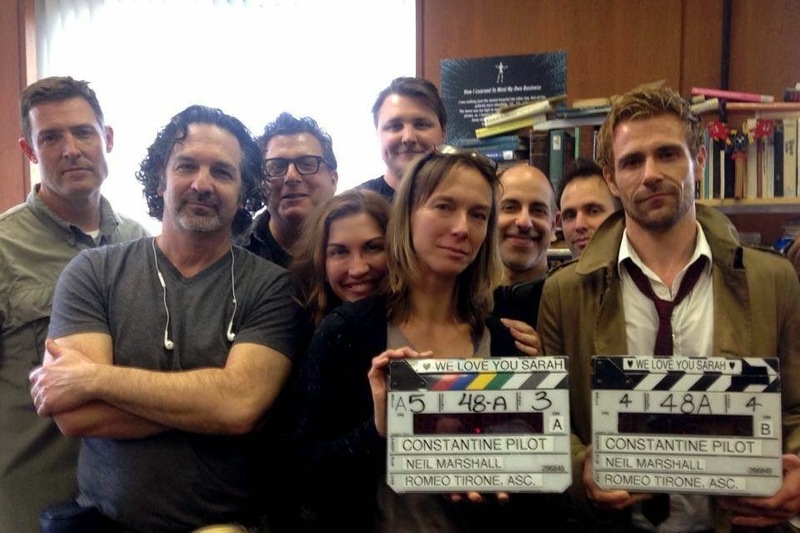 The first images from the upcoming NBC series Constantine have been released. Both show title character John Constantine, played by British actor Matt Ryan. 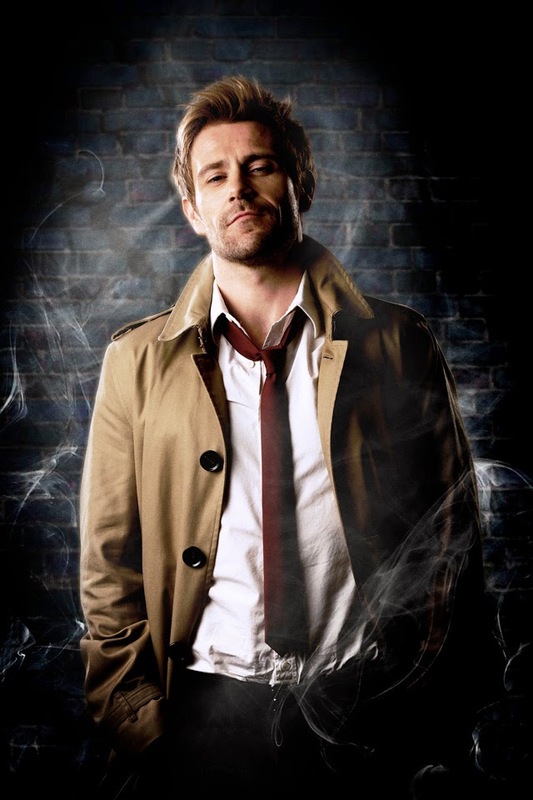 Constantine is based on the classic DC Comics title Hellblazer and focuses on a chain-smoking Liverpudlian con-man who helps defend the world from supernatural forces. Keanu Reeves starred in a 2005 movie version which got a lukewarm critical reception. The pilot for the new series was produced by David S. Goyer (writer of Dark City, the Blade trilogy and Christopher Nolan's Batman films, as well as, less inspiringly, Man of Steel), written by Daniel Cerone (Dexter) and directed by Neil Marshall (The Descent, Black Sails, Game of Thrones). 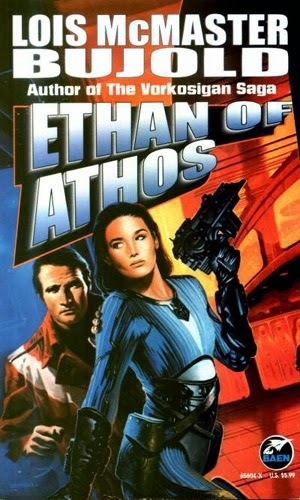 Ethan of Athos is, chronologically, the sixth novel in the Vorkosigan Saga, although it was the third to be written. Even more confusingly, it is often omitted from counts of the series due to the total non-appearance of the series' main character, Miles Vorkosigan. 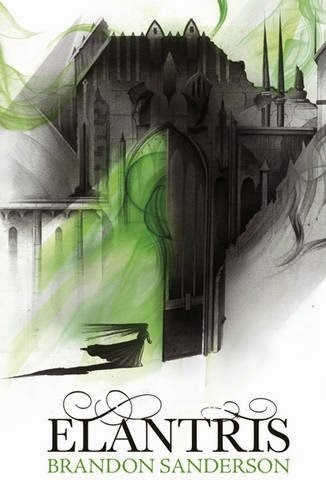 However, Ellie Quinn, who appeared briefly in The Warrior's Apprentice and goes on to make more important appearances alongside Miles later on, plays a major role and this book establishes a fair bit of her character and backstory. So my recommendation is to accept it as part of the saga and move on. I enjoyed Ethan of Athos a lot. It's what Bujold does best, a comedy-of-manners romp taking in scheming, intrigue, wheels-within-wheels, deceptions and double-bluffs, and a thin layering of real science (a more thorough exploration of the uterine replicator technology mentioned in previous books) and social commentary on top. There's some nice character scenes and moments of humour, and Bujold writers her typical wit. However, the book feels like a somewhat missed opportunity. There are a few SF novels which take a look at societies where either women are put in charge or are dominant (such as David Brin's Glory Season), or where the normal genders don't exist as we know them (obviously, The Left Hand of Darkness), but surprisingly few about the idea of a planet where only men exist. 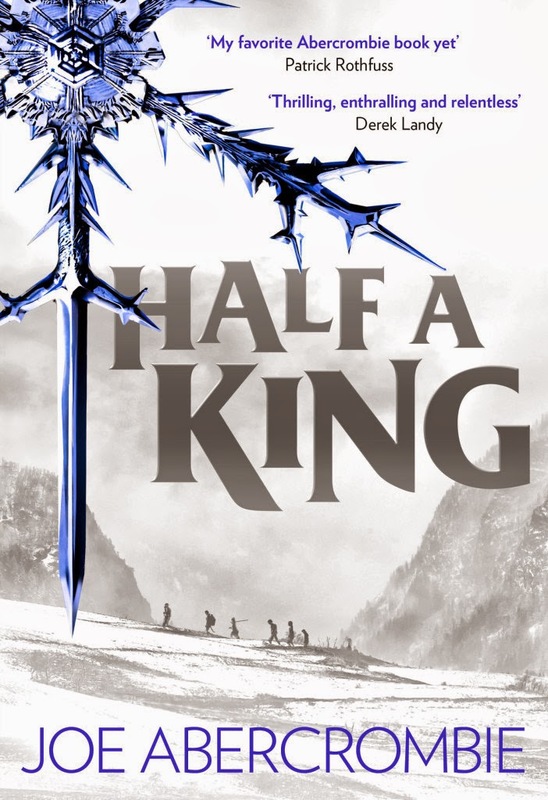 The early and closing chapters set on Athos show that Bujold has put a lot of thought into this idea and how it works, and the resulting commentary it offers up on male gender roles is facinating. But as a concept it only bookends the novel, the bulk of which is a more basic - if still fun - SF thriller. 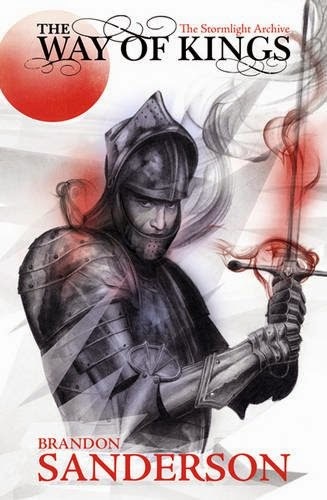 Ethan of Athos (***½) is a solid, enjoyable SF novel, but one that feels like it could have been a lot more than that if the story had remained on Athos for its duration. Otherwise, this is a reasonable addition to the Vorkosigan series. The novel is available now in the UK and USA as part of the Miles, Mystery and Mayhem omnibus. Selina Meyer is the Vice-President of the United States of America, in theory one of the most powerful positions in the world. In practice, she is a spare tyre kept busy with trivial makework and assigned a staff of dysfunctional backstabbers. Veep is an American comedy series created by Armando Iannucci, a renowned British comedian and satirist. Veep can be regarded as a companion work to Iannucci's BBC series The Thick of It, which explored the dysfunctional workings of British government via a fictitious government department and the people who run it. Like The Thick of It, Veep has no laughter track and its comedy comes from the situations the characters find themselves in, either through bad luck or through their own ill-conceived actions. 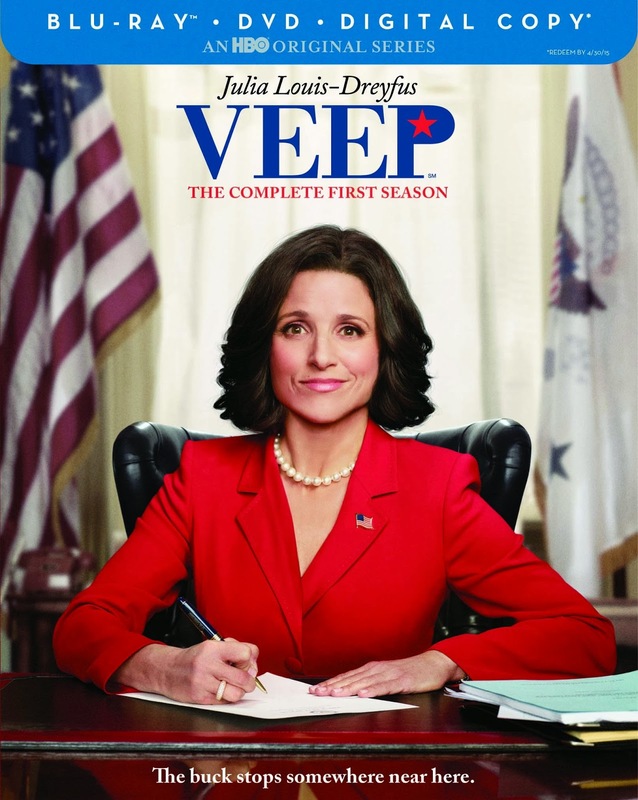 Veep is centred on the character of Selina Meyer, played with aplomb by Julia Louis-Dreyfus (best-known for her recurring role as Elaine on Seinfeld). Meyer is a former Presidential candidate whose failed to make the cut and feels she has been given a powerless role to prevent her being a threat to the President. It's also suggested that the President's wife (who, along with the President, is never seen) hates her, and several storylines revolve around Meyer inadvertently upstaging the President's wife through fashion or headline-grabbing 'cute' moves like getting a dog. Almost every episode features a moment where Meyer asks if the President has called, only to be told no. The bulk of the comedy comes from Meyer's staff: Gary Walsh (Tony Hale), her neurotic personal aide; Amy Brookheimer (Anna Chlumsky), a well-meaning but slightly inept fixer who ends up taking the fall for some of Meyer's misjudgements; Mike McLintock (Matt Walsh), Meyer's director of communications who, bizarrely, insists that he owns a dog when in fact he does not; Dan Egan (Reid Scott), a new, ambitious and ruthless staffmember who is not quite as smart as he thinks he is; and Sue Wilson (Sufe Bradshaw), Meyer's secretary who seems to regard politics (and almost everything) with bored contempt. Completing the regular cast is Jonah Ryan (Timothy Simons), the liaison with the White House, a fantastically creepy and self-obsessed man specialising in inappropriate behaviour and inventing useless new acronyms (FDOTUS for the President's potential new dog). What makes the show work is that not all of these people are shown to be completely useless (otherwise they wouldn't be in their jobs), but that they prove unable to adapt to rapidly-developing situations. In particular, the older staff-members have no idea on how to deal with blogs and Twitter and spend vast amounts of time obsessed with style and spin rather than the substance of their policies. Performances are uniformly excellent, with Louis-Dreyfus bringing her A-game and convincing as a politician of ambition and substance whose career has taken an abrupt left-turn into near irrelevance, resulting in frustration and annoyance. This is brilliantly show in a sequence where the President falls ill, so Meyer is called into the White House's emergency situation room, where she is almost overcome by the plush furniture, flashing lights and people treating her like she's the most important person on Earth. When the President recovers, Meyer is dumped back to her previous task, eating yogurt at a dessert store in a futile effort to show how down with the people she is. The gap between the two positions has never quite been nailed so ruthlessly as this. Special mention must also be made to Timothy Simons, who makes his character despicably punchable whenever he appears but you also want to hear what fantastically inappropriate thing he's going to say next. He's the Joffrey Baratheon of the West Wing, though fortunately without the power to execute anyone. The season has a nicely-developed storyline about Meyer desperately trying to get some policies - any policies - through government to show she's not completely useless. An innocuous tweet about cutlery in the first episode snowballs out of control, taking with it several government bills and congressional hearings, whilst an apparent crisis in Meyer's personal life threatens to upset her career until she dumps it on one of her aides. The story, characters and dialogue are all sharp and very funny. Compared to the genius of The Thick of It, Veep more than holds it own. Veep isn't quite as knives-out nasty as The Thick of It at its most vicious, mainly due to the lack of a character comparable to Malcolm Tucker (although foul-mouthed Congressman Roger Furlong, who appears late in the season, shows hints that he might go that way). But Iannucci's decision to make the new show stand on its own feet without resorting to his old stand-bys is both a brave one and one that works. There are a few episodes that don't quite gel together and it's arguable if some of the staffmembers would get away with what they do without being fired on the instant, but overall this is a very strong opening season. Season 1 of Veep (****) is available now in the UK (DVD, Blu-Ray) and USA (DVD, Blu-Ray). Season 2 will be released in June. Season 3 starts airing on HBO in the USA in April. HBO has confirmed that it is planning to end Game of Thrones with its seventh season, due to air in 2017. The show's fourth season starts airing in a few weeks, meaning that the show has three seasons to run afterwards. This announcement marks a change in the plans of showrunners and executive producers David Benioff and D.B. Weiss, who had previously said they favoured 80 episodes (or eight seasons) to wrap everything up in. The new statements from Benioff, Weiss and HBO seems to be pretty definitive, however. Some have interpreted that to mean that eight seasons is still on the table. However, Lombardo's restatement of seven being the plan seems to make that unlikely. Instead, he is referring to the fact that HBO has gone eight seasons or more, but only on (relatively) cheap comedies like Entourage and Curb Your Enthusiasm. In fact, before True Blood no major, big-budget drama show had ever made it to seven seasons before on HBO, with six being the upper limit. The Sopranos was fudged with its final season having twice as many episodes as normal but then split in half to effectively get to seven seasons, but production-wise it was six seasons. It is possible that something similar could happen here, especially if GoT was moved to a timeslot later in the year (Boardwalk Empire's September slot will be available soon). If GoT's final season was moved to September and aired in two parts, maybe six months apart, that would give the production team the time to film more episodes than normal for the final season. Whether HBO is inclined to do that or willing to spend the money is a different question, of course. At the moment, however, it appears that Game of Thrones will end in June 2017 after seven seasons and 70 episodes, which puts book author George R.R. Martin and fans of the books in an awkward situation. As of now, five of seven planned novels in the Song of Ice and Fire series (which Game of Thrones is adapting) have been published. The sixth book, The Winds of Winter, is underway with George's publishers hoping to bring it out before the end of 2015. However, that still leaves the final book, A Dream of Spring, some way off. 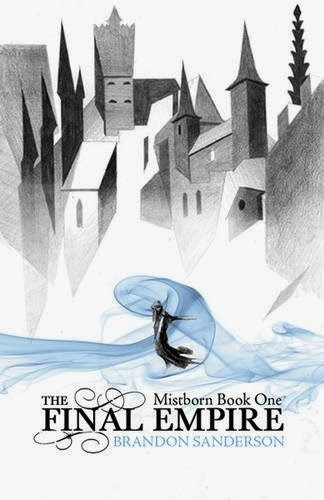 Bringing it out in less than two years given the time spent on the previous books (at least four and a half years for Winds, over five and a half for A Dance with Dragons and just over five years for A Feast for Crows) would seem unlikely. In a recent interview with Vanity Fair, George suggested that he might still be able to do it - although it would be a "tight," - but this was in the same article where Benioff and Weiss indicated that eight seasons was still doable. Dropping it to seven would appear to make it almost impossible for Martin to stay ahead of the series without a dramatic (and unprecedented in this series) increase in writing speed. The TV show will remain - at least broadly speaking - faithful to the books even if those books aren't out yet. Martin, Benioff and Weiss sat down at Martin's house in Santa Fe, New Mexico early last year along with script editor/writer Bryan Cogman to drum out story outlines and character arcs so the scriptwriters would be able to plan out the rest of the series. If anything, though, that makes things more difficult for the book fans uninterested in the TV series. 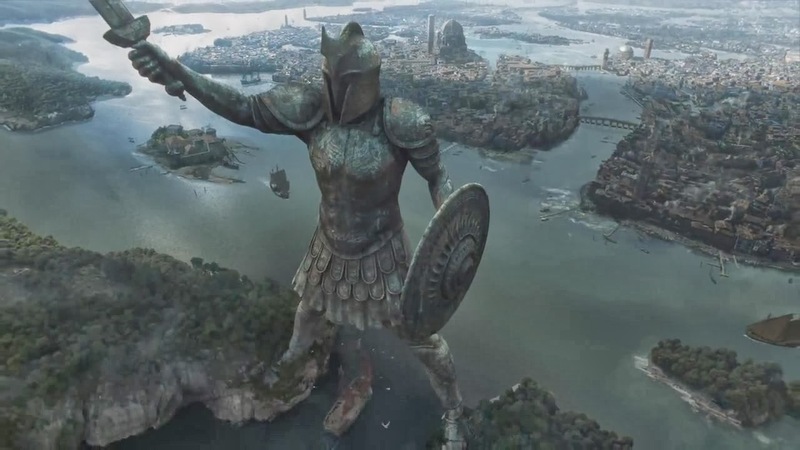 If the TV show had a completely different ending, that would be one thing, but if the TV show is going to reveal who gets the Iron Throne, who Jon Snow's parents are and explain the motivations of the Others/White Walkers, and that's the same information as will eventually come out in the books, then it will constitute the biggest and most expensive spoilering of the end of a book in history. Because of GoT's media presence, it may be untenable for people to avoid spoilers for years on end. As of right now, it appears that Game of Thrones ends in just over three years' time, regardless of if the books come out. What, if anything, GRRM can do about it remains to be seen.